Good Saturday Morning! It was so nice reading your comments from yesterday and checking out your blogs to see what goodies/presents everyone received!! I'm a bit impatient though...I asked for $$ and Santa delivered but now I have to wait for my things to arrive.....can you say STALKER for real ROFLOL!!!!! K, enough drama.....onto my creations for today! My first card is for the Jazzy Inspirations Challenge. We had to use the color combo of the album cover--red, black & white-- for our cards which was a blessing since it's one of my fave colors to use this time of year...Valentine's Day!! The sentiments you see are more from the new Level 2 Hostess Set....told you they were a lot of fun to use! Hop on over to the Blog and participate with us! We'd love to see what you come up with!! My other card is for the Limited Supplies challenge on SCS. We were required to make a card that wasn't Christmassy at all....colors, images, etc. I used an old SU! set called Bubble Queen with some older retired DSP. I picked that paper particularly for the colors.....all I had to do was bling up the bubbles and a few flowers---all done!!! Thanks so much for stopping by! I hope you have a great rest of the day/night. I like the swirly paper on the red and black card and the combo of the top note and scalloped border on the second card. They're all fabulous!. I especially like the bubble bath one! How fun! Great cards! Love the bubble queen - what a fun project! The pink & blue reminds me of one of my favorite outfits when I was younger! Super cards. Love your inspiration card. Wonderful design and my favorite colors too! The Bubble Queen is such a fun set and your card is adorable. Great job! Awesome job on the inspiration challenge, love your take on the album cover. 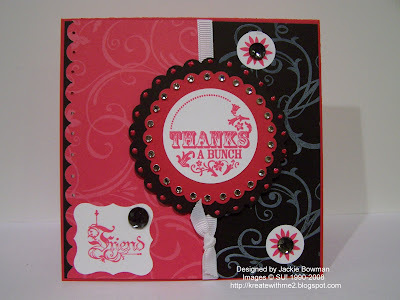 What beautiful cards, Jackie...I love all the colors, layouts, stamps...all the little details are AWESOME!!! Adore that Bubble Queen one!